The most difficult items to move from home to home are your appliances. That said, when you want to take your appliances with you, a little planning will go a long way in helping you move while also mitigating stress often associated with the moving your appliances. Consider these five tips shared by Jumia to help you move your appliances. The first thing you should do is measure the size of your appliances to see if they will fit through the door. In some cases, you may need to remove the door to get clearance or bring the appliance in through a larger frame such as a sliding glass door. Once you have the dimensions and planned out the move, you can proceed to prepare the space and the appliances for the task. Clearing the floors is one task that should not be overlooked. Dirt, stones, or other foreign objects can damage your floors more than the appliances themselves. Vacuum, sweep or mop the area where you will be bringing in the appliance. Once there are no foreign objects in the area, you can put down a protective covering where you will be moving the appliances. While you can use cardboard to protect a clean floor, it is the least effective way. A much better way to protect your floor is to use leftover carpet pieces or runners. Now that the home you are moving your appliances into is ready to accommodate them safely, you will need to prepare the appliances by removing food and place it in a portable cooler. unplug the fridge and you can do this for every other item in your home. Moving your appliances is not an easy task, so one of the most important things you can do to simplify your move is to ask for help from friends or family. Having more hands on deck will enable the load to be distributed more widely. Having fresh arms will make the move safer and easier. 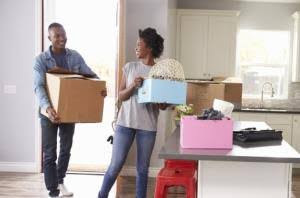 Now that you are excited about your move, and you have properly prepared both space and the appliances, you are ready for the easiest (and hardest) part: the physical labour. With confidence, you will be able to move fridges, stoves, washing machines, washers, and dryers into your new place, knowing that your floors, walls, and appliances will be in the same condition as they are now.